We just finished a big negotiation with Charter Communications for an awesome, new 61,151 SF operations center that is the largest office deal in Charlotte for 2018. The building is located at Forest Park, where I developed a number of buildings while at Trammell Crow. I’ve leased this building several times over during the years, and recently worked out a deal with Charter Communications (Spectrum – the cable folks). This is going to be a powerful, new asset for Charter and its more than 500 rockstar employees who will work there. Tip of the hat to Keith Bell and Zach McLaren with Cushman and Wakefield for being professional advocates for their client, Charter Communications. I get asked a lot about real estate negotiations, and the best way to approach them. People tend to think a broker has to swing heavy, maybe even land low blows, to get a good deal. It may surprise you that the best in this industry do not intimidate, they don’t use tactics and ploys. They know that preparing for commercial real estate negotiations doesn’t have to feel like entering a boxing ring. Leave the gloves at home, roll up your sleeves, and take the positive, offensive approach—this sends the message that you are prepared to win. 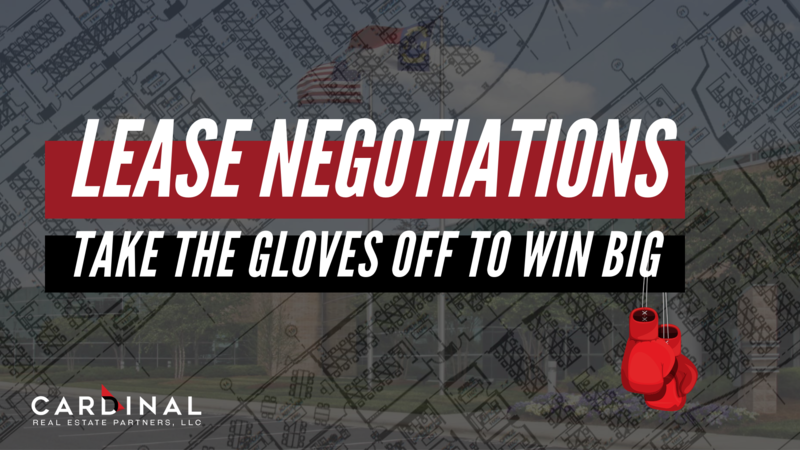 Here are some steps to keep lease negotiations on an even playing field that produces the best results for both sides. Determine what you want to achieve from the negotiation, including financial and non-financial objectives. Know the few points that you are going to have to “go to the mat” for, and be open with the other side if they are giving you something that has little value to you. For example, the length of the lease was important to us. We found creative ways to get Charter comfortable with a long term lease. Assess your strong and vulnerable points so that you can be prepared to leverage or hone these to your advantage during the lease negotiation process. If you know the prospect is emotionally attached to the property, then you might be able to build on that emotional connection to bridge the differences of opinion on the lease terms. Or, if the prospect knows that you’ve been desperately trying to lease the property for a year with no tenants in sight, you need to think about how much you are willing to concede. Conduct research to gauge competing properties in terms of their lease pricing and features to help you better understand where you need to be or to justify why you have set certain terms. We knew that the most important outcome of being well prepared for any negotiation is to have a solid second alternative and knowing what has to happen for that to become your top choice. We had at least two other prospects for the building that were less ideal than the Charter deal. That is the type of confidence that will result in a win for your team. Rely on a strong team to support you during the negotiation process. Having a spokesperson to speak on your behalf also helps build on the negotiation skills of others if you don’t feel confident. Plus, you have the knowledge and skills of a group of individuals in your corner to help establish common ground. Ask this person pointed questions about what they know and do not know about the other side, coach them on their delivery and suggest a tactic or two that they can have up their sleeve. Congratulations to Charter Communications on its upcoming space. I love the building and think it will be a successful space to call home.